I’ve been helping people find that elusive McManus story for years. Here are some requests that have come through the “Quick-Find a Story” submission form. Scroll through and you might see the story you’re looking for, or even discover a new one. Rancid Crabtree feeds mushrooms to a dog that falls over looking dead. The story is “A Really Nice Blizzard” and is found in the book Rubber Legs and White Tail-Hairs. The dog was imaginary though, Rancid was playing a trick on Crazy Eddie Muldoon. That story is titled “The Backpacker” and is found in the book A Fine and Pleasant Misery. riding a bicycle when his pants leg gets caught in the chain and he can’t stop. Also one-legger. The bicycle story is titled “The Two-Wheeled ATV” and is found in the book A Fine and Pleasant Misery. One-leggers are mentioned in several stories: “A Big Chill” in The Bear in the Attic, “How to Go Splat!” in The Grasshopper Trap, “The Snow Cave” in The Bear in the Attic, and “What’s in a Name, Moonbeam?” in Rubber Legs and White Tail-Hairs. The actual element in the story was an old bearskin bonnet, and they were not really camping, just sleeping out in the backyard. The story is titled “Psychic Powers for Outdoorsmen” and is found in the book They Shoot Canoes, Don’t They? This one took quite a bit of effort because of the way people mis-remember story elements. They were huckleberries at the top of the mountain. The story is titled “A Road Less Traveled By” and is found in the book The Night the Bear Ate Goombaw. I wrote about our unreliable memories in the blog post Finding the Hairy Bonnet. The story “Sequences” is found in the books The Night the Bear Ate Goombaw and The Deer on a Bicycle. That story is titled “Salami on Rye and Hold the Wild Gobo” and is found in the book Never Sniff a Gift Fish. Hi there, I’m looking for the story when Patrick buys a horse for his children. The horse doesn’t like adults, but is a real good children’s horse. Thanks. The main story that fits that description is titled “Edgy Rider” and is found in the book Never Sniff a Gift Fish. In that story the horse’s name was Pokey. Pat also mentions the experience in the story “The Stupidity Alarm” naming the horse Huck (in the book Into the Twilight, Endlessly Grousing) and again in more detail in the story “The Horse in My Garage” in the book of the same name. The horse is named Huckleberry, and Huck for short. Do you remember a story about you used to have to fix tires rather than change them? The humor climax was when your finger would get caught between the tire and the rim. This story appeared in the Outdoor life column in the 80’s some time. Does that sound familiar? 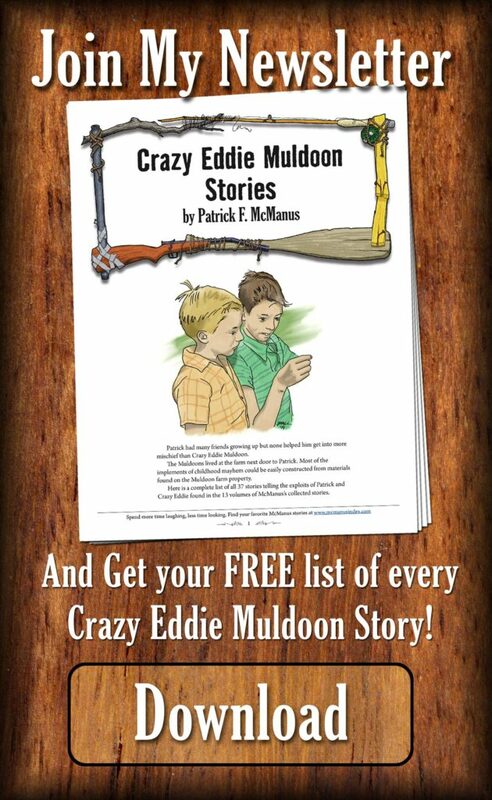 The Muldoons moved away at the end of the summer when Pat and Crazy Eddie built a submarine in the duck pond. The story is titled “Crash Dive” and is found in the book Real Ponies Don’t Go Oink! That story is titled “The B’ar” and is found in the book A Fine and Pleasant Misery. That story is titled “Controlling My Life” and is found in the book Real Ponies Don’t Go Oink!